My name is Reuben, I’m here to ensure you fully understanding how our templates work and are comfortable with all the features so you can get started making a flyer for your listing right away. The goal for this sample template is to give you a chance to see, first-hand, how easy our fill-in flyer templates are and to see if our templates are a good fit for your business. Below is a “walk-through” guide on How to add text, photos, and how to save and print your flyers. Additionally, I’ve included an extensive FAQ and Trouble Shooting section at the bottom of this email, just in case you had any trouble or questions regarding our template products. The first step is to open your flyers. 1. Simply double click the flyer and your computer should automatically recognize it’s a PDF and open the template in Adobe Reader. 3. Launch Adobe Reader by choosing Start > Programs> Adobe Reader, then File>Open> choose your flyer template. Our templates are specially engineered PDF documents that open and function using the basic Adobe Reader application. This is what make our template different and easier; no special software. Let’s starting filling in the blanks! Every text field is editable. Simply click on the text you want to edit and start typing. Point click and change images. 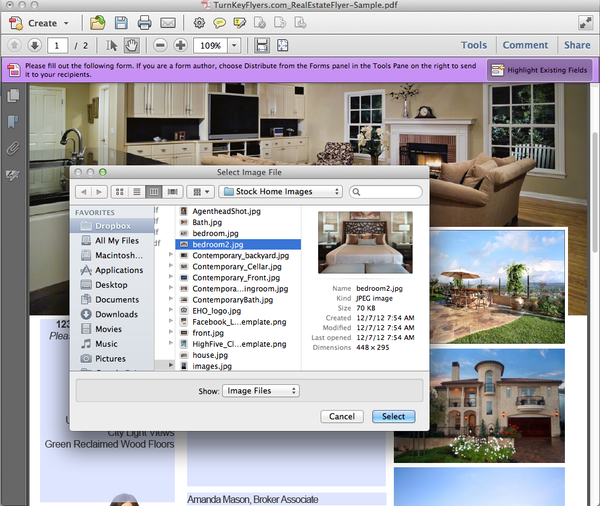 Just like the text fields, click on any picture (logos and QR code images included); choose an image on your computer, then select insert. Your images will simply snap into place without any tweaking or adjusting. Saving is easy. Select File > Save As. Printing is even easier. Push the little Print Icon. This is a Sample Template meant for you to see for yourself how easy and convenient our Fill-In Flyer Templates can be. The goal is for you to see if our templates are a good fit for you business. As a fellow small business owner you can appreciate all the work, resources, and energy that has been invested into creating a good quality product and service. We are the sole creators and inventors of our products. We produce each template in-house. Our team has invested over 4 years of research and development getting our product to its most simplistic: fill-in-the-blanks. Can I change the font, color, or text size? No. The text color, font, and sizes are fixed. You’ll notice entering text is fairly easy and not complicated at all. This is because we’ve pre-selected the size, font, and color of all the text for you; this is so you’re not bogged down with a dozen options. We’ve interviewed hundreds of agents and brokers, just like you, and the most important feature you’ve asked for is “easy and simple to use.” This is why we’ve streamlined the templates so all you have to do is fill-in-the-blanks and go. Can I move the pictures? No. Just like the text question, we’ve streamlined the photo options so adding photos is as simple as point and click. Will your templates work on Mac? Yes! They will works seamlessly on Macs. Can I use this on my iPad or mobile device? We’re currently working on a mobile version; so not just yet. Do you have any “Open House” templates? 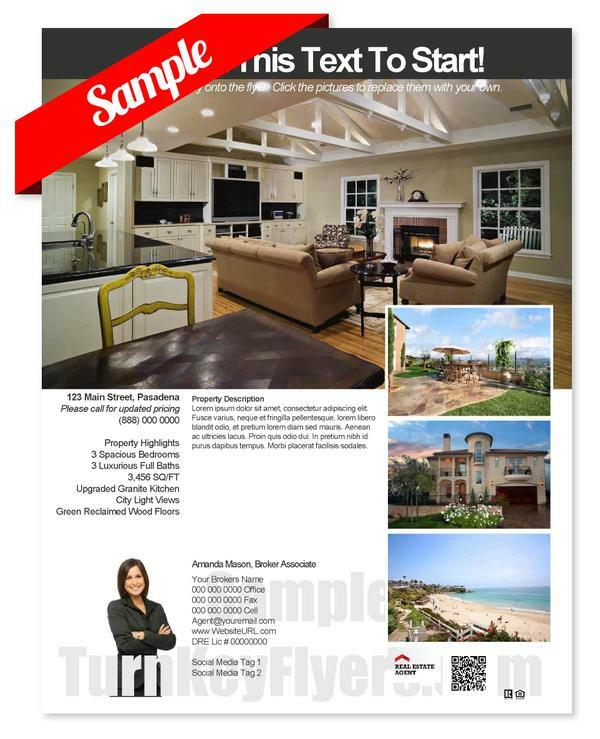 We do; however, you can turn any of our templates into an Open House, Just Listed, In-Escrow, or Just Sold flyer in seconds. Simply type Just Listed, Open House, Just Sold, etc., into the headline field. Presto! You’ve got yourself a new specialized flyer! I just had a Listing price reduction (increase); how do I update the flyer? Simple: Just re-open the flyer (assuming you saved it) and change the price. Will your templates work on Adobe Acrobat? Yes and you’ll have more advanced options! Using Adobe Acrobat allows you more saving functions like: Save as an image. I have an old computer; will these templates work? Yes, granted you have the latest version of Adobe Reader. How do I get the latest version of Adobe Reader? I don’t live in the United State; do your templates work in other languages? YES! In fact, 30% of our customers are International. If you’ve downloaded the latest version of Adobe Reader recently, you should be ok since the font settings of your country are already loaded. However, if you wish to download the latest extended language font pack, simply search the Internet for Adobe Reader Font Packs – Extended Languages. How soon after I purchase can I start using the templates? Immediately! As soon as the file finishes downloading, you can use them right away. What if I find they are not a good fit after all? No problem. We have 60-day money back guarantee. Simply email us and we’ll work with you on a refund. Can I print these at home? Yes! We designed these templates for you create and print at home. What if I want to have them printed at local print shop? Even better. Simply send the print shop your PDF flyer and they’ll know what to do with them. Our templates are actually designed to work with professional printers. What are single-user license and a multi-user licenses? (1) Single-User License – This is ideal for an agent or broker. This grants you unlimited right and use our templates for your own personal and business use. Sharing, selling, or distribution of our templates is a violation of your user license. (2) Multi-User License – This is a multi-package license. Ideal for small broker offices and/or teams up to 5 people. This option grants one (1) parent license and four (4) sub-licenses with unlimited right and use of our templates for their own personal and business use. If you choose to refund your order, your license (and/or sublicense) will be terminated. What If I need more than 5 licenses? We have large broker licenses available. Our templates are a considerable savings alterative to hiring an in-house graphic design person or team. Send us an email and we’ll create a custom license to fit your needs. Do you have a testimonial or review page? Do you have other helpful tutorials? Yes. We have a full line-up of tutorials and how-to videos here. 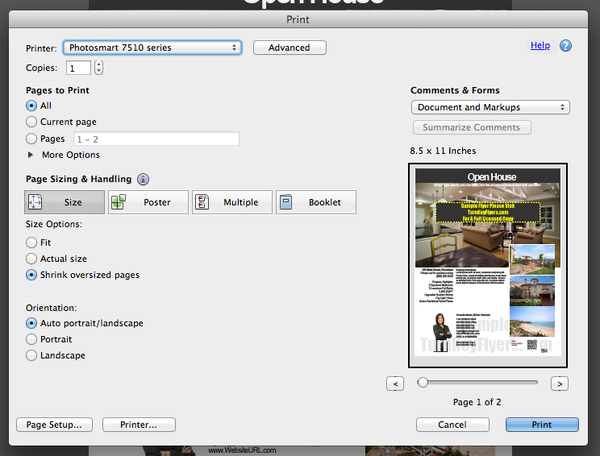 I’m using a Mac, my templates open up but I can’t change the photos? Open the Adobe Reader application. 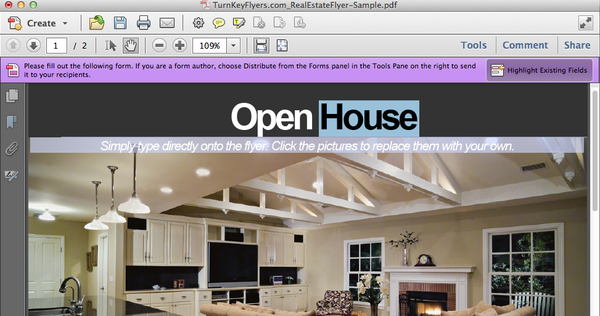 Select File > Open File > then choose your flyer template. Where did my flyer template go? I can’t find it on my computer? Chances are, the flyer is in your download folder. Check there first. To access your download folder simply choose (PC) the Start Button, in the search field type “download,” the results should give you the Download folder. On the upper right portion of your screen (Macs) click the search icon. Type “download” and the download folder will appear. Open the Download folder and search for your file.